One Monkey Don’t Stop No Show is sharp and hilarious. 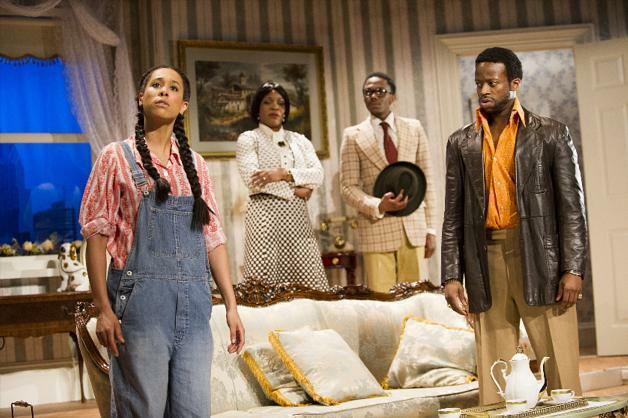 Eclipse Theatre Company brings Don Evans’ play to life at the Tricycle theatre, going on now through 9 February. The story is set in Philadelphia, where a high-society black family is confronted with low-society problems: an unplanned pregnancy and unrefined company being two of them. Avery Harrison is a respectable preacher who secretly longs to put the passion back into his marriage. His wife Myra is obsessed with keeping up appearances in their posh neighbourhood. Their bourgeois lifestyle gets turns on its head on the arrival of their country-bumpkin niece Beverly whose father just died. Street-smart Caleb Johnson gains responsibility over 20-something Beverly, much to his dismay. Reluctantly, he brings her to his apartment, determined to clean her up and turn her into the type of woman he would want. Meanwhile, the Harrison’s son, Felix, has relationship problems of his own. His feisty girlfriend tells him she might be pregnant and he must prove to her he would do the right thing. At the heart of the very funny production is a relatable topic: the lengths we go to trying to disguise who we truly are. As the characters struggle with their identities, their lively banter moves the story without losing momentum. A cast announcement, laugh track and “ON AIR” sign add to director Dawn Walton’s vision for the show, staged as a live-audience sitcom. However, the parallels didn’t match during monologues, and some of the audience members were confused by this adaptation. Most of the play takes place in the Harrison’s apartment. Unfortunately, the upper left-hand side of the theatre has the unfortunate experience of only hearing some major parts of the play as Caleb’s apartment is blocked from view. The performance touches on serious issues without losing its pep. Cultural black identity, feminism and midlife crises are explored in the script with humour and ease. A witty scrip and the actors’ comic timing keep the energy up throughout the two-hour show. This raunchy comedy is heart-warming and a must-see. One Monkey Don't Stop No Show is on until 9 February at the Tricycle Theatre, 269 Kilburn High Road, London, NW6 7JR. Tickets cost £18-£22. Visit tricycle.co.uk to find out more. Review by Laura Kramer. Photo by Tristram Kenton.